Talk to Almera, just south of the Barbarian Outpost. 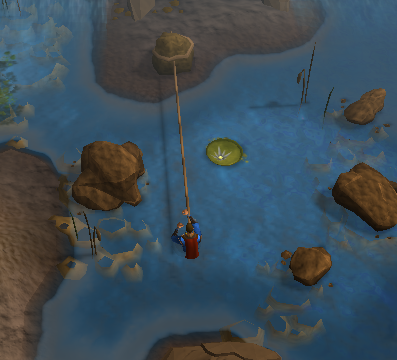 First off, speak with Almera, found northwest of the Fishing Guild and just south of the Barbarian Outpost. Optionally, teleport to the Barbarian Outpost and walk south to the quest start. 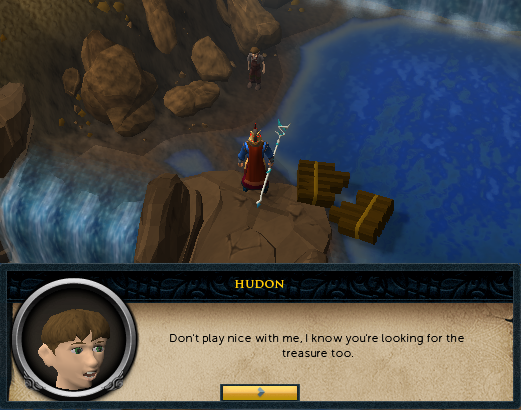 When she asks if you'll help her, ask her what you can do and she'll tell you that her son Hudon is looking for treasure in the river behind her house. Tell her that you'll check on him, and then board the raft in the back. The raft will crash into a rock and it seems that you're stranded, but you'll find Hudon on the bank of the river and he refuses to leave. Walk south along the small island, and then use your rope with the large rock across the river so that you can cross it. Note: If you forgot your rope, just click on the large rock to jump into the river and wash up further down the river. Once across, use the rope with the tree to climb down onto a ledge, and then get inside the barrel so that you can be carried down the river without taking damage. You should now be on the shore, so go inside the house to the northwest and talk to Hadley about the Elf King, Glarial and the treasure. Now go upstairs and search the bookcase in the center of the east wall for a Book on Baxtorian and read it to learn about what happened to Glarial. 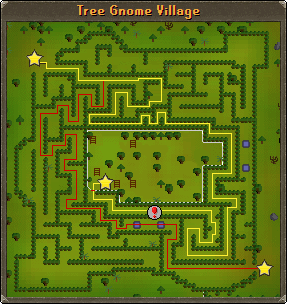 Head to the Tree Gnome Village just southwest of East Ardougne, following the maze until you reach a ladder which leads to a small cavern. 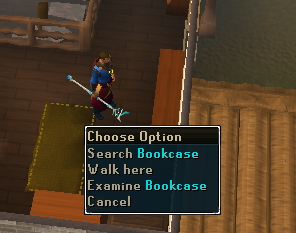 Head to the east room and search the large crates near the entrance to find A Key. Use this to open the gate in the west room and then talk to Golrie. You'll also find Glarial's Pebble on the floor, which Golrie will let you keep. Now leave the tomb (you can teleport out), put any weapons and armor in the bank and head to the Tombstone of Glarial just northeast of Hadley's house. Warning: There are level 84 Moss Giants in this cavern, and Prayer does not work here. Proceed with caution! Use the pebble with the tombstone to find a cave entrance. Enter the dungeon, and then search the chest to the west to find Glarial's Amulet. Take Glarial's Urn from the grave to the south of the ladder, leave the tomb and head back to the bank, taking any weapons, armor and food that you'll need. 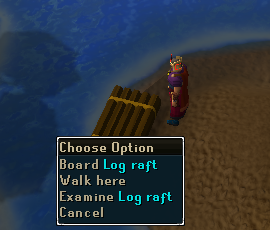 Now head back to Almera's house and take the raft down the river. Just as before, use your rope with the rock to get across, and then use it with the tree to climb onto the ledge. Now equip Glarial's Amulet and open the ledge to go inside of the Waterfall Dungeon. Once inside, you'll find 3 different paths; head to the east, past the level 66 Shadow Spiders and into the room where you will also find several level 28 Skeleton Mages and level 84 Skeletons. Search the crate in the north part of the room for A Key. Now head to the room to the west, past the level 122 Fire Giants and use the key with the door to the north to unlock it. Use it with the next door to find a room with 6 Pillars and a floating Chalice of Eternity. Use 1 Air, Water and Earth Rune with each of the pillars (be sure to complete this step completely, or the room will fill with water). Next, use Glarial's Amulet on the Statue of Glarial, and the ground will shake and rise up. 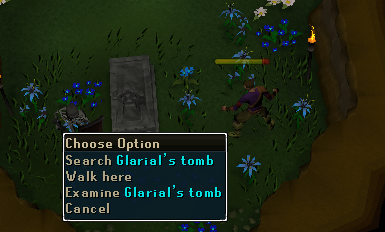 Now use Glarial's Urn with the Chalice to take your reward and complete the quest. If you don't have five free inventory spaces available, you will need to free up some space and then use Glarial's Urn on the chalice to complete the quest. Warning: Do not try and take the Chalice, or you'll be swept away! 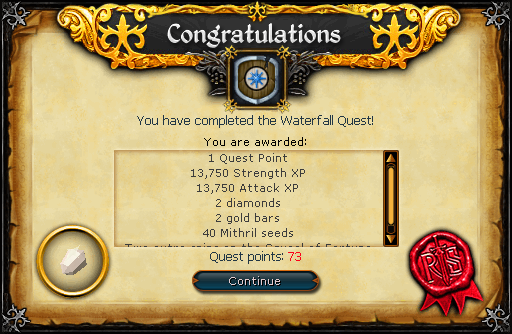 If this happens to you, you'll need to get another amulet and urn to enter the Waterfall again.